"Please March off the Colours. God Bless You"
Her Royal Highness The Duchess of Kent. Somme Barracks, Catterick Garrison. 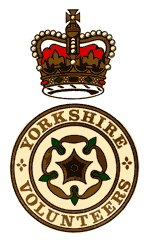 The Yorkshire Volunteers Regimental Association offers membership to all who have served in the Regiment or in the Territorial Army units, which were amalgamated to form the Yorkshire Volunteers, or in one of the battalions or other units that succeeded the Regiment. Associate membership may be open to others. The aims of the Association are to promote Regimental traditions and support succeeding T.A. Units in Yorkshire. The Association will safeguard the name of The Regiment and the interest and welfare of those who have served in or with it, or other members. 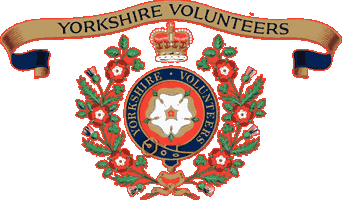 Ordinary membership is open to anyone who has served with the Yorkshire Volunteers or with one of the Territorial Army Units it succeeded or with one of its successor units. Associate members must be proposed and seconded by Ordinary Members and must support the aims of the Association. The Association consists of a number of local branches, which meet with varying regularity throughout the year.